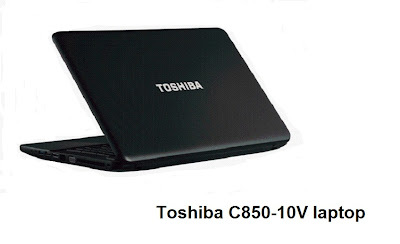 Toshiba C850-10V review - today at For consumers blog we are going to take a look at one of the affordable Toshiba laptops powered by Intel Celeron D dual-core processor. 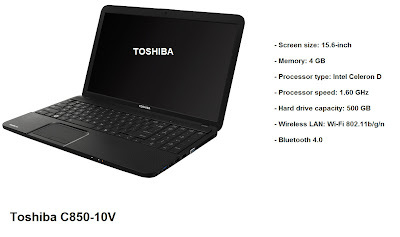 Toshiba C850-10V laptop has a 15.6-inch LED backlit display. This laptop will probably suit best to home users and students who doesn't want to spend too much on a computer but want to have the advantages of dual-core processing speed and nice big HD display. Toshiba C850-10V also has very good connectivity options including Wi-Fi 802.11b/g/n and Bluetooth 4.0. The price for the Toshiba C850-10V laptop is around £300 (in UK) which is a fair deal considering the good features and specs this laptop has. You can also check some of the cheap Toshiba laptops we have reviewed so far.